Obelisk is a new columnar dwarf pear variety. It takes up very little space in the garden, as it grows with a particularly upright habit. 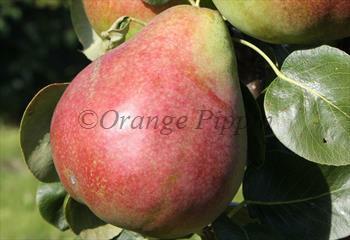 The medium-sized pears are mostly green, sometimes with a red flush, and ripen quite late - early to mid-October. They can be kept for several months over winter in a fridge or cold store, and have a mild flavour and firm flesh. A further useful feature of Obelisk is that - unlike the vast majority of pears - it is reliably self-fertile and can be grown without another pear tree nearby for cross-pollination. Please fill in the details below and we will let you know when Obelisk pear trees are back in stock. Obelisk is in flowering group 3. Obelisk is self-fertile and does not need a pollination partner, although fruiting may be improved if there is a compatible tree of a different variety nearby. Since it flowers in the middle of the blossom season it can be pollinated by most other pear trees. We graft most of these trees on Quince A rootstock, which is usually semi-vigorous, but Obelisk is a naturally dwarfing variety and is unlikely to reach more than about 2.5m or so in the longer term, with a spread of less than 1m. The branches are not stubs (as in Ballerina apple trees) or spurs (as in cordon-trained apples and pears), instead they grow to a normal length - but they curve upwards and stay close to the main stem. The naturally dwarf habit of Obelisk also makes this a good variety for growing in a large pot or planter on a terrace or patio. Little or no pruning is required for this variety. Obelisk was developed in Slovakia.